Absolutely. 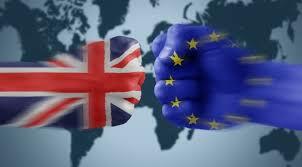 The vote this week in favor of the UK leaving the European Union is profound. There are short and long term implications that will impact England, Europe, as well as the US. The degree of financial, political, and cultural impact is certainly debatable, but this was a significant shot heard around the world. Is this meaningful from a Christian perspective? Does this have anything to do with the Bible? Was this predicted by the Prophets of old? Does this mean the beginning of the end? No. Don’t be foolish or deceived. This has nothing to do with the Bible or Christianity directly. But it does reflect one nation’s identity and desire for sovereignty among its own people and culture. It is a modern example of a people standing up for themselves vs. a centralized rule that may sound good but is fraught with failure and inefficiency. It’s also a reflection of a very real concern about immigration and the watering down on national identity and culture. Britain got it right. Good for them. How Should Christians Feel About Immigration? The Brits, and all of Europe, have an immigration problem. Certainly the US does as well. The UK is just dealing with it first through the Brexit referendum. In essence the people have spoken in a close vote (52% vs. 48%) reflecting their desire to control their own borders and sovereignty rather than be controlled economically and quasi-politically by centralized socialist rulers based in Brussels at the European Parliament. Nothing wrong with socialists. They just have a differing world view about central or decentralized control of people and nations and the role of the State. Yes, because as citizens we are all impacted by the actions of our governments. With political ball being played with global refugees (for the most part from Syria and South America) fleeing poverty, persecution (from Islamic terror) and corrupt regimes, European countries and the US are faced with humanistic and political decisions. Shouldn’t We Love Our Fellow Man? “Love the Lord your God with all your heart, with all your soul, with all your mind, and with all your strength” (Mark 12: 28-31). How we doing with that one? But I believe mass immigration without proper screening for health and security reasons in this modern, dangerous world (ISIS) is foolhardy and not about love. Don’t be duped by what you read or hear in the media. Think about it. Common sense calls for transparency, order, wisdom and humanity, not stealth and deceitful actions merely for future low cost workers and voters for the State. There are ways to admit, screen and assimilate needy immigrants in a humane and smart manner. Leaders in the EU and those in the US were/are not taking the prudent approach. The result is Brexit today, and a very large wake-up call looming for the US in the fall presidential election. Aren’t Christians Supposed to Obey the Government? Yes, Biblically speaking, Christians are called to be good citizens and submit to civil government authority (see Romans 13:1-7). But a Christian’s highest authority is God. History shows us that this can lead Christians to be seen as treasonous. But we are called to “obey God, rather than men” (see Acts 5:29). Daniel, Paul, Peter all came up against anti-God governments and faced the consequences. In the short term, this is not the challenge we face. Rather, we face a secularized government that puts up a growing list of standards that oppose Biblical standards, be it abortion (sanctity of life vs. sexual freedom), gay marriage (corruption of God-ordained marriage institution between man and woman), transgender bathrooms (good grief), or even the teaching of evolution (mandated State anti-God education) in public institutions without the opportunity to discuss alternatives. Yes, Christians have a tough challenge in staying strong and even informed in the midst of State-controlled media messaging that is predominantly anti-Christian. No need for action. Just be aware and watch the opposing sides go into messaging and spin mode to impact your thinking about this very significant movement in the UK. Well done, Brits. Good luck with what’s to follow. Are you a blind follower of your government? Thank you Mike. I look forward to your blog as you correctly divide the Word and provide foundation on how we in Christ view contemporary events. Keep it up mate!